Upcoming changes to our facilities! See below for information about the Building Committee's proposed renovation and expansion to the Ridgeview Christian Church facilities. This plan was presented by all the ministry staff and elders during our congregational lunch on August 26. 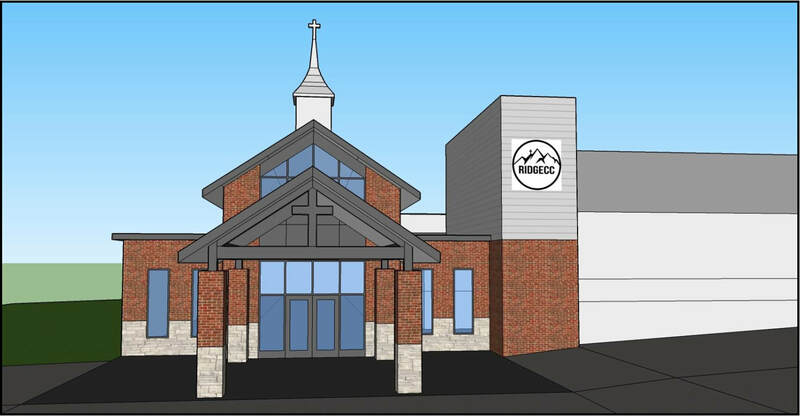 On September 9, the congregation voted to proceed with these building concepts. The fine details will change, but this is a general idea of what our facilities are moving toward. Rendering of the future front door from the center of the expanded parking lot. Click here to see this image in full-size. A new entryway will be created that faces the parking lot (top-center of the above photo). As soon as a family enters this door, immediately to their right will be child check-in. Without taking any further steps, a family will see both the entrance to worship services and the bathrooms. The new entryway has more square footage than the gym. The current sanctuary will become a permanent youth space. The room's high ceilings and large size will still allow for games and activities as well. 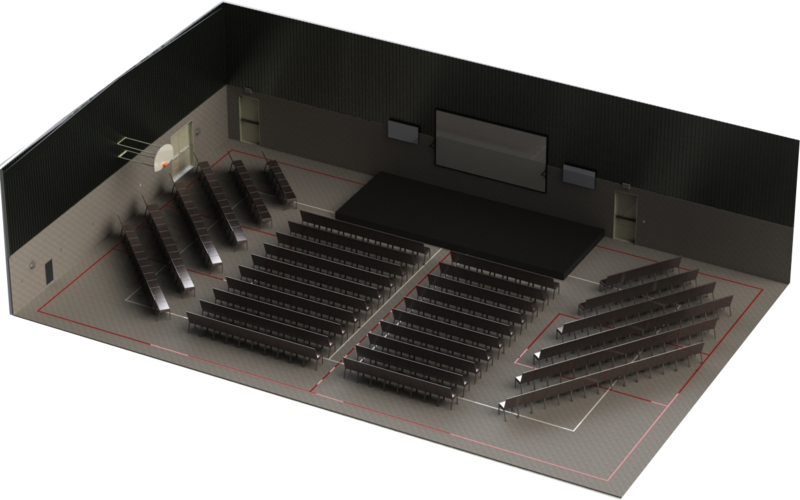 This is not what the gym/sanctuary will look like, but this is a layout to show that the gym can hold 315 chairs (identical in size to our existing sanctuary chairs), which increases our seating by 45%. ​Everything in the gym will be portable and able to be torn down and placed in storage during special events that need to use this type of large room. Accessibility: an elevator and ramps will make every part of the building handicap accessible. 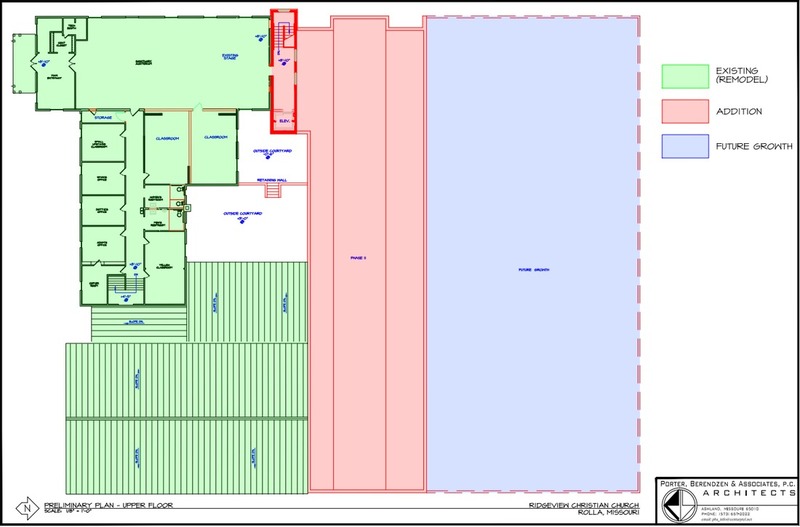 More bathrooms: 14 toilets (7 women's stalls, 3 men's stalls, and 4 urinals) will be close to the sanctuary. 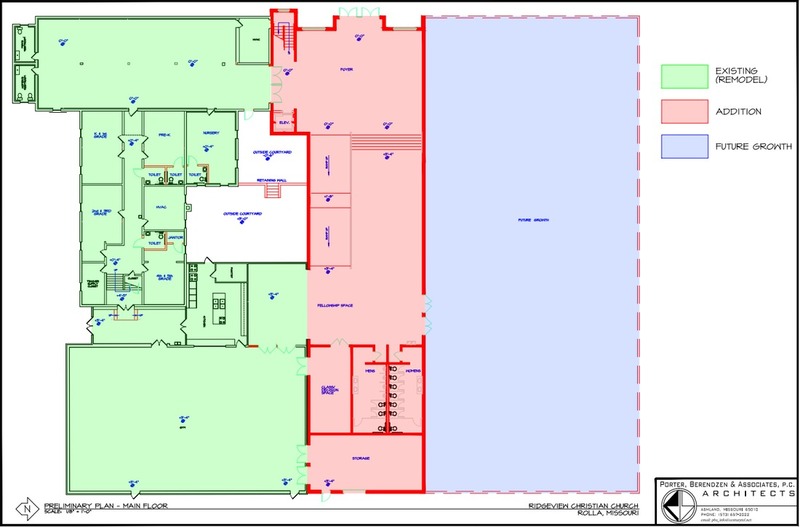 Even more bathrooms: The children's hallway will receive some new bathrooms as well, enabling more safety and less class interruptions. ​Courtyard: an enclosed courtyard that can be accessed from the children's area for a safe, outdoor play environment. With the Highway 72 Expansion, it is easy to see that God has placed us in a 5-talent location (read Matthew 25:14-30). We also believe that this church is filled with 5-talent people. We do not want to be the servant that buried God's gifts in the dirt and hoped to keep the status-quo, desiring simply to not lose anything. Instead, we want to be the servants of God that return His gifts back with interest. God has blessed Ridgeview Christian Church with a good location, with growth, and with energy. We are excited for what God has in store and don't want any of our facilities to stand in the way of more people calling on the name of the Lord.